My diagram to help writers look at their own working patterns and create a long-term career is still out there and being used. The Scriptwriter's Life has been downloaded well over 2000 times. 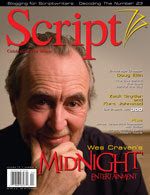 And its also featured in the next issue of Script. Its a great issue all round actually with a regular column from podcasters Sam and Jim as well as a blog round up that features the UK's very own Andy Coughlan. That's in addition to an article on Robert Towne, an interview with Edgar Wright, an article on short films and even a 'tax man' special. I was never a fan of Script and I thought when it was taken over by Final Draft that it would become one big advert. But in fairness I like the look of it. Give it a quick look and see what you think - is it worth a fiver? Obviously my Scriptwriter's Life diagram remains free to everyone! Question to myself: If this magazine was just on-line then why would fewer people pay? Even if it was 50p? Technorati Tags:Scriptwriter's Life,Scriptwriting,Andy Coughlan,Script,The 3 circles.